Today I’m looking at Sony’s extreme wide-angle zoom, the 12-24mm f/4 G. As photography has progressed, more and more exotic lens designs have become possible. Decades ago, a 24mm lens was considered extremely wide and 20mm was an almost unheard of ultra-wide angle. Now, the standard ultra wide zoom starts at 16mm, and more exotic designs that go wider have become more mainstream. The first ultra-wide zoom to go all the way to 12mm was released only 16 years ago, in 2003, when Sigma produced their 12-24mm f/4-5.6 zoom. Since then, Nikon has made a 14-24 part of their standard kit, Canon has developed an 11-24. These extreme wide-angle zooms have become more common, but the design of such lenses is anything but simple. Most of these extreme wide zooms are absolutely huge, which is what makes Sony’s 12-24mm f/4 so appealing. It’s a constant f/4 aperture lens with that supreme width, but it is quite reasonable in size and weight, making it a very attractive option to become the everyday wide zoom for many shooters. Let’s see how it performs. The Sony 12-24mm f/4 G is a part of Sony’s high-end G series of lenses, and as such is well-constructed and feels solid in the hand. 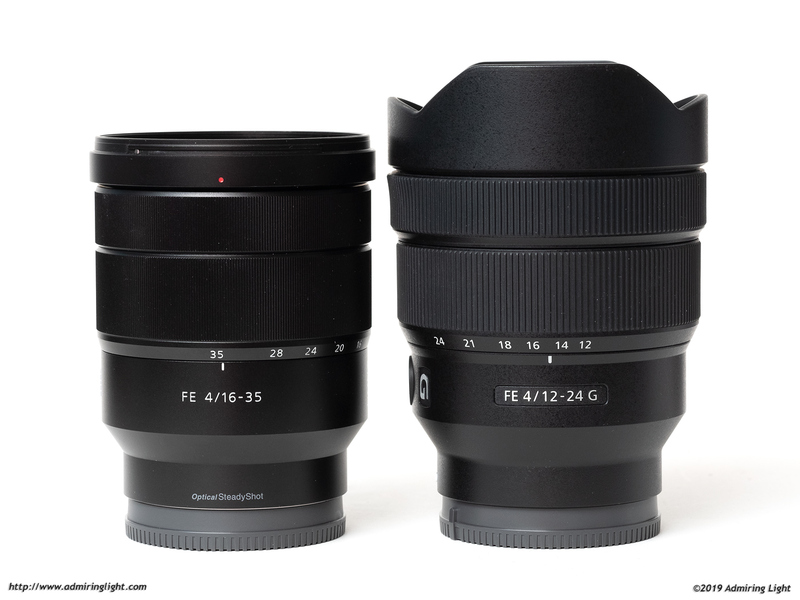 As I mentioned in the introduction, the 12-24mm is a small lens for an extreme wide-angle, with a size just a bit larger than Sony’s own 16-35mm f/4, and a bit smaller than the 16-35mm f/2.8 GM. The weight falls in that range as well, being a bit heavier than the 16-35mm f/4 and a fair bit less than the 16-35mm f/2.8. 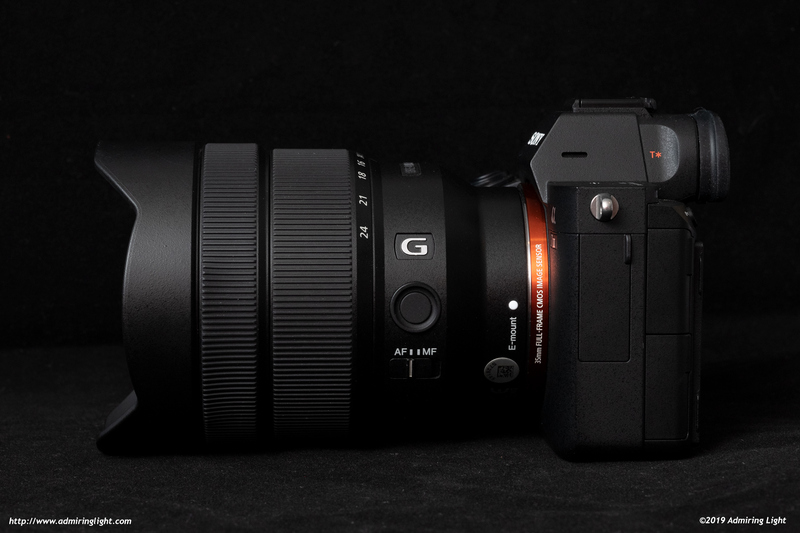 The 12-24mm weighs a relatively svelte 565g. But where this becomes even more impressive is when comparing to the DSLR competition. Canon’s 11-24mm f/4L is a whopping 1160g, more than double the weight of the Sony 12-24mm, while also being over 2cm larger in diameter and nearly 2cm longer. The small size makes this a great option for everyday use. The lens is constructed of high-grade plastics over a solid, presumably metal frame. There is no flex anywhere in the lens body, and it feels reassuringly solid. The lens features weather sealing, but lacks a gasket for the lens mount, so I wouldn’t trust it to extremely wet conditions, due to potential damage to the camera. 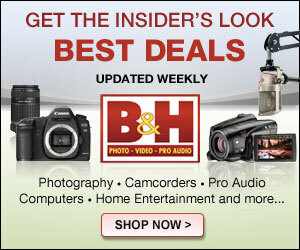 The lens features two broad rubberized rings for zoom and focus control. The zoom ring is well damped and feels excellent in use. The focus ring turns smoothly, but is a bit too lightly damped for my personal taste. Like most Sony E-mount lenses, the 12-24mm is focus by wire in a free spinning manner, so there’s no focus scale on the lens itself. The 12-24mm f/4 G has a built-in petal shaped lens hood that cannot be removed, which provides some minimal shading from stray light, but more importantly protects the extremely bulbous front element from taking physical damage. That bulging element and the extremely wide field of view also prevent the lens from utilizing standard screw-in type filters, and the lens does not have a filter thread up front. There are square filter adapters for use of 150mm square filter systems, but I’d imagine most people won’t want to deal with that. One nice stop-gap that can potentially be employed, however, is the use of a 77mm filter in certain ranges. The lens hood is just a big larger than the exterior diameter of a 77mm filter. Some ingenious photographers discovered that placing gaffer tape or felt flocking around the edge of a filter to build up that diameter a bit will allow a 77mm filter to nestle into the hood. It works well, but only from about 14-24mm. Wider than 14mm, the angle of view becomes too extreme to work with a filter of that size. Also the lens group is zoomed forward at the widest focal lengths and the front element will make contact with the filter. If you use this trick, you will obviously have to be careful. The Sony 12-24mm f/4 G features a fast and quiet autofocus motor, and I found it to work very well in my daily shooting. Focus was extremely quick, and very accurate. I didn’t notice any focus issues during my time with the lens. I also couldn’t hear the focus motor at all…focusing was dead silent, making the lens quite appropriate for use in quiet environments or for shooting movies. 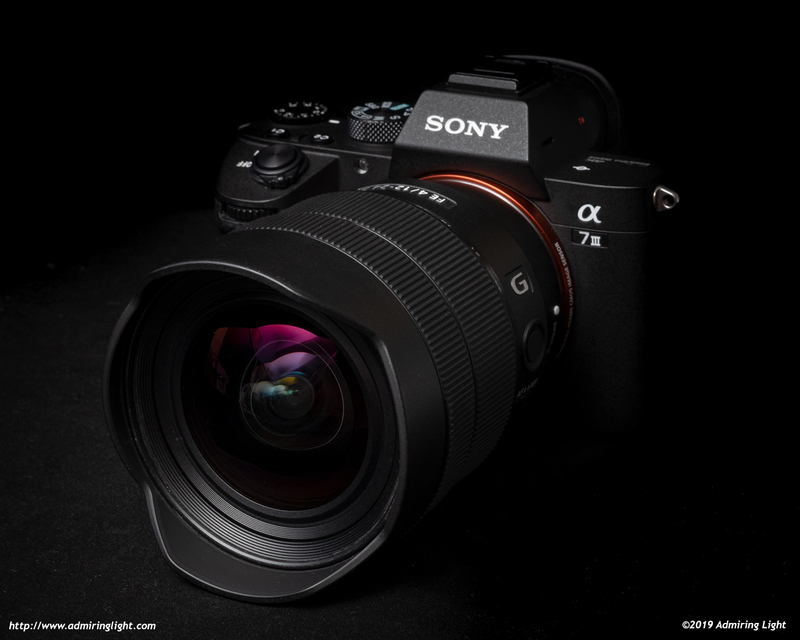 Unlike the FE 16-35mm f/4, the 12-24mm does not feature an optical stabilizer, so you’ll have to rely on the newer Sony cameras’ in-body image stabilization. Pingback: ?????????????? FE12-24mm F4 G ??????????? | ????????????? Pingback: ?? ?FE12-24mm F4 G????????????????????????? | ???????????? ?